Come and relax in this exclusive residence directly on the fairy tale river Övre Brocken located in the forested and watery Värmland. 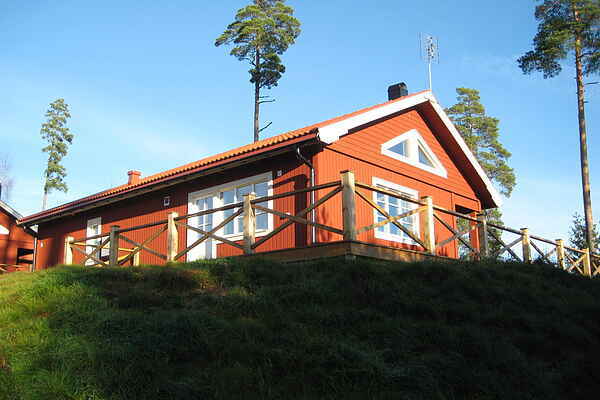 Enjoy the sauna in the home, where you have a wonderful view over the lake and the forests! And after the relaxing sauna, gather for a drink in front of the wood fire. For sports enthusiasts there are professional mountain bike routes, and you can take horseback rides, wood raft or canoe trips, or go on an elk or wolf safari! There is a large bathing beach, a fire pit, and for the kids there is a great playground. The campground is 25 km from Torsby. Torsby is a great town where there is plenty to do. Its own marina, supermarkets, swimming pool and bowling alley. In the winter you can ski at the Hovfjället ski area, 10 km away, with 15 slopes and 20 km of Nordic routes. Or drive 40 km further to the Branäs ski area with 15 km of slopes and many facilities for the entire family. Go ice fishing, take a snowshoe trek or snow scooter safari, and you really shouldn’t miss a dogsled ride. For holiday makers in the summer who don't want to miss winter and yet want to Nordic ski, this is also possible in a ski tunnel in Torsby. A holiday in 2 different countries? That's possible too! The holiday home is located on the border with Norway, really worth a visit! In short, you’ll enjoy the beautiful mountains with lovely views, the forests and the pure air of Sweden.